Peterborough captain Ulrich Ostergaard’s ‘10 Year Spectacular’ will be staged in front of his hero. Danish great Hans Nielsen - widely regarded as one of the finest riders ever to grace the sport - will fly in for the testimonial at the East of England Showground on Sunday, March 13 (2pm) which launches the new speedway season in the city. But Nielsen, who starred in 22 world title successes during his glittering career in the 1980s and 1990s, won’t just be an interested spectator - he is also planning to take to the Alwalton track for a few laps. Ostergaard said: “It is amazing to have Hans here as part of my meeting and I’m so proud that he was prepared to come over to England for it. “Hans is someone I have looked up to ever since I first started to watch speedway as a kid. “It was a huge honour for me to ride in my hero’s last meeting in 1999 and also to race in the same team as Hans in the Danish Superleague once that year. Nielsen, now 56, won three world individual crowns in the space of four years during the 1980s when it was staged in a single-meeting format. He also became the first man to win it in the current GP format in 1995. 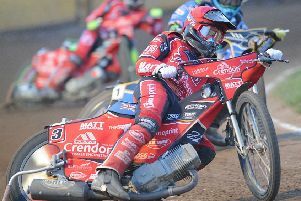 He enjoyed an extensive club-racing career in England with Wolverhampton, Birmingham, Oxford and Coventry and his presence could certainly boost the turnout for Ostergaard’s testimonial. The Panthers captain has assembled a stellar cast to compete in an individual meeting with a host of support races also planned. Ostergaard has persuaded a total of three of his fellow Elite League title-winners with Panthers in 2006 to line up. Hans Andersen, Niels Kristian Iversen and Piotr Swiderski all feature in a 16-man field along with Kenneth Bjerre, Mads Korneliussen, Krzysztof Buczkowski, Danny King and Kenneth Hansen. The line-up is completed by Ostergaard himself and five of his Panthers team-mates for 2016 - Nikolaj Busk Jakobsen, Nicklas Porsing, Michael Palm Toft, Simon Lambert and Emil Grondal. The remaining Panthers rider this season, British reserve Tom Perry, will feature in races against club asset Danny Phillips and a trio of young Danish talents - Jesper Sorgaard, Tobias Thomsen and Peter Karger. Ostergaard added: “I could not be happier with such a great list of riders who are prepared to race for me. “I’m so pleased to have been able to put together a meeting featuring my current team-mates, many guys I’ve ridden with in the past and some great friends I’ve made during my career.